KEN BROWN CALLIGRAPHY IN THE RODEO ARENA. It had been a blistering day in the arena. Fresh pies from the day before had become baked under a relentless July 5 sun. The dusty block of ground was unevenly imprinted with thousands of hoofprints where hell had broken loose for some brave bull and bronc-riders whose 3-4 second ride ended abruptly when they were hurled into the air to land quickly with a dull thud on the red dirt, bruised and often trampled by the critter just ridden. Steer wrestlers and calf-ropers and barrel racers had also torn through the loose, deep dirt the day before, entertaining those watching the mayhem in that little current-day coliseum where man against animal drew big crowds from Choctaw County in Hugo, Oklahoma. The arena was surrounded by welded rails of pipe and gates at ground level. Wide, hard boards lined and placed at several different levels provided seats for the cheering fans and families of the fearless rodeo cowboys. Around more than half the arena, smooth sheet metal signs, advertising local businesses, rose from the dirt to the first pipe rail about 4’ feet high. I had been in town for the summer after being unceremoniously booted out of Oklahoma State University for spending too much time on Calligraphy and not enough on calculus and chemistry. Probably the best thing that ever happened to me. The three day rodeo had begun the day before on July 4. Si Jackson, one of the 4-or 5 local barbers in Hugo at the time, was in attendance and noticed one 4’ x 5’ blank sign among the others ringing the arena. Of course those had been painted by my childhood hero, Henry Lyles, the local professional sign-painter who wielded a wicked wipe with sable brushes to make magic as they cut razor-sharp lines and perfect swirls in his hand-lettered block and script characters on billboards and local merchant windows. His letters were perfection. They looked like those that now come out of a computer and sent electronically to a tool that rapidly cuts the letters into adhesive-backed mylar in a rainbow of colors. All digital. No human skill. Those letters are now peeled off a backing material and stuck on store windows, sides of trucks, and a thousand other places by sign shop employees who know nothing about the almost lost art of brush lettering and the exquisite signs…like those that you’ve seen in old movies and that still grace the side of a few old buildings still standing. Quite orthopedic are the mylar letters compared to the sheer art Henry made with his brushes, often standing on a wooden sling 40 feet above the ground, painting a local billboard along highway 70 or 271. Si, the barber, had heard of my fledgling start in the hand-lettering world so he figured he could engage me for a sign job for less than Henry would charge. We talked. He hired me. Five bucks to hand-letter Si Jackson’s Barber Shop, Hugo, Oklahoma in my own script that had already caused my grade point to nosedive into the toilet at OSU. Thrilled to get the job, I didn’t consider that I had to buy a can of black paint and a 2” flat brush out of that five dollars! That was $3.75 at the local Sherwin Williams store on Broadway. I arrived at the arena about 2:00. Lord only knows why I waited until the sun was at its zenith! In cutoffs, no shirt, and flip-flops I trudged across the arena to the blank spot. For the first line I could sit, cross-legged, and letter the words. For the second line, I was on my belly in the muck-laced dirt, reaching up to make my yet-new Calligraphy find a new venue. The sign was opposite the elevated ‘press box’ area where the announcer would give the stats on the previous ride and the next soul risking life and limb to outlast the hapless animal he’d try to conquer. The sign was done in about 90 minutes. By the time it was finished it was dry under that July 5th sun. I stood back and looked at that first official job in my own hand-lettering and was proud. I’d give a pretty penny for a photo of it but that was the last thing on my mind. I had just earned a buck and a quarter from my early love affair with letters! Around 8:00 p.m, Wyndol Fry, my lifelong friend and classmate, drove by my house in Hugo and invited me for a drive to Tyler’s for a Coke. I was watering the grass, still cooling off from my own big day in the empty rodeo arena. Still in my dusty cutoffs and flip-flops, I grabbed a t-shirt and jumped into Wyndol’s car for the ride to the drive-in. We had barely parked when another car pulled up beside us. A gorgeous young lady Wyndol knew, but I didn’t, was driving. She had a girl friend with her. Wyndol spoke and invited them over to his car to share a cool Coke with us. They came. Wyndol’s acquaintance was Gail. She climbed in the back seat and I moved from the front to the back. The other lovely took my place in front beside Wyndol. Now, mind you, I still had the residue of rodeo dust all over me. Though I was sporting a clean white t-shirt I must have smelled like a billy-goat or one of the freshly-roped steers that had been where I just came from. However, as this beautiful girl sat down beside me, all that vanished from my consciousness. There’s no way it could have escaped hers. I got introduced to the ladies, we drank our Coke, made small talk, and in about 3 minutes Wyndol was in reverse, leaving Tyler’s for parts unknown. I’ll spare you the details but we had a sweet, innocent evening under the stars not far from Tyler’s as we watched a near-full moon brightening the sky during conversation and our first kiss. The ‘card’ for Gail this morning. At the time I lettered the rodeo sign, I had virtually no experience with a brush. I had spent all my time with SPEEDBALL pens and ink. The chisel point on those pens rendered the look below in Calligraphy, though I hasten to add that the rodeo sign was not quite as polished as this, done 25 years later. However, the brush was also a ‘chisel’ shape…thin at the edge and 2″ wide for the 48″ x 60″ metal sheet. The pen I used to do the word below was a shade under 1/4″ wide and was black ink on white paper. The commercial printer made it black when the book cover was produced in publishing my book. Bottom line: One thing leads to another, often better. The fifteen-cent SPEEDBALL pen at OSU created one of those defining moments in my life. Insignificant purchase. Easy little assignment. It was the launch pad for my life’s work. The pen was related to flat brushes for the same effect. The pen lead to a dental drill. You know where the dental drill has taken me. To both sides and the middle of Canada several times and all over the U.S. many more. Watch for little insignificant signs and opportunities in your own life and work. They often lead to the road less-traveled. KEN BROWN ENGRAVING NOW CAN TELL…and ask the question: WAS IT AN ESTEE LAUDER MISTAKE OR MIRACLE? Part one of three. 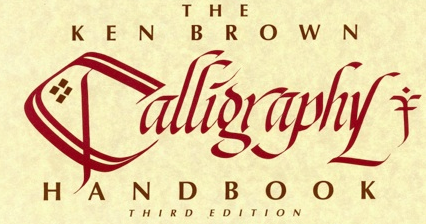 9 Responses to KEN BROWN CALLIGRAPHY IN THE RODEO ARENA. Awwwwww…..makes me want to cry! Beautiful, sentimental and very loving! Happiest of Anniversaries to two of my favorite people and may your marriage continue to be blessed! Hugs to you and the Missus! Seriously, congrats to you both. You are part of a sadly dying breed. And can’t wait for verse 53! YOU CONTINUE TO SURPRISE ME WITH YOUR GENUINESS AND NOSTALGIE(?). 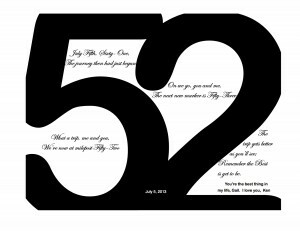 52 YEARS IS ONLY THE DOWN PAYMENT ON A LIFE OF LOVE TOGETHER , BLESS Y OU BOTH WITH MANY MORE TO COME. Ken, loved the story and congratulations, keep on keeping on!! Congratulations!! Ken & Gail… Beautiful story. Another wonderful year for you two lovers!! It’s been a continuing “52 year” love story, and I “LOVE” love stories. You both are an inspiration to all of us. May you have many more! Congratulations! My question, who was the other girl? 52 years and counting. Congratulations to you two wonderful people.